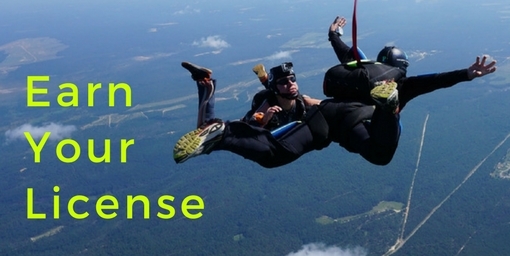 Are you considering going tandem skydiving? Better, have you already booked your tandem skydive? Whichever, as a first time skydiver you are probably wondering what to expect and what to do. These are our top tips from getting the most out of your tandem skydiving experience. Schedule a time as early in the day as you are able. We realize the earliest slot may not be possible for you, as some days book up fast or you might have a long journey, but don’t book needlessly late. Why? Weather. Skydiving is weather dependent and we get the best of it early in the day. The clearer the weather, the better your experience (and your pictures) will be! We provide goggles. The rest of your attire is up to you. We suggest that you wear comfortable and flexible clothing, such as shorts and a t-shirt. Tennis shoes are perfect footwear (high heels are definitely not). Don’t wear anything that can’t be secured. You will probably want to remove jewelry for the jump. Don’t worry if you wear glasses, they fit under the goggles. If you have long hair, you’re going to want to tie that up out the way – your instructor (who has to jump behind you) will thank you! Eat as you normally would on the day of your skydive. Skipping a meal can result in low blood sugar. Adrenaline and low blood sugar aren’t an ideal combination, and you may feel unwell. Don’t overeat either, that could end messily. Dutch courage (drinking alcohol) will not help you skydive. If you drink before your tandem skydive, you will not be permitted to jump. Skydiving from powerful turbine aircraft means less waiting time and more altitude – which means more freefall time! Make sure you are jumping one. At Skydive Paraclete XP, we have a fleet of them. Double (or triple or quadruple…) the fun and bring a friend! An amazing lifetime experience is best shared with somebody special. If you book iwith a friend, we can put you on the same airplane. If none of your friends/family want to jump, bring them anyway. They can cheer you on from the sidelines, see you land and celebrate your achievement with you. The more the merrier! Get the pictures! How else is everyone going to know how awesome you are? We promise in the years to come these images will be priceless to you. Learn more about our video/photo packages. Don’t Put It Off – Go Tandem Skydiving NOW! Experienced skydivers often hear “I’ve always wanted to do that”. Don’t let skydiving be something you say you wished you’d done. Let it be something you tell everyone how much you loved doing. Book your tandem skydive online today!